You can send offers, messages, sales alerts directly to your Facebook Fan Page and Twitter!Spread the word and increase offer participation among your fans and followers. 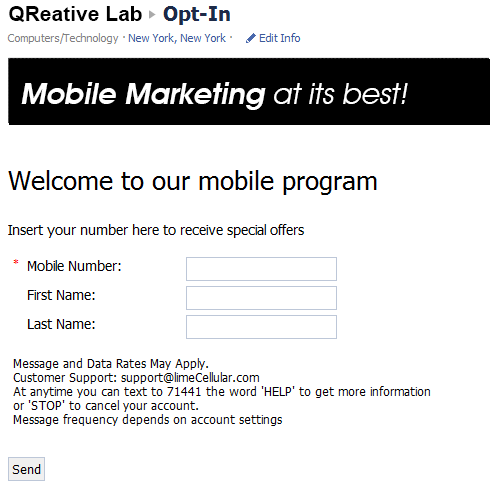 By adding our opt-in API to your Facebook page you will increase your loyalty opt-in list. When sending out a message, coupon offer, or mobile webpage, you have the convenience of putting it immediately on your Facebook wall! Once you connect your Lime account with Facebook, you’re able to integrate your SMS campaigns with this effective social media tool everyone uses to advocate their favorite places, products, and things with ‘likes’! If you manage multiple Facebook pages on one e-mail, we make it easy for you to select the appropriate page! Your text messages and coupons will post to the page of your choice and you can change pages if necessary. Motivate mobile users to opt in on your fan page! Simply follow our guide and with the help of a free application like MyTab, paste our iframe code into your page to create the page quickly and easily! Spread the word! Tweet your offers and text messages for your followers to retweet. This feature works exactly like the Facebook feature. Simply connect your Lime Advertiser account to your Twitter by logging in to your account and when you send out a message or coupon offer, check ‘Post to Twitter’, it’s easy!